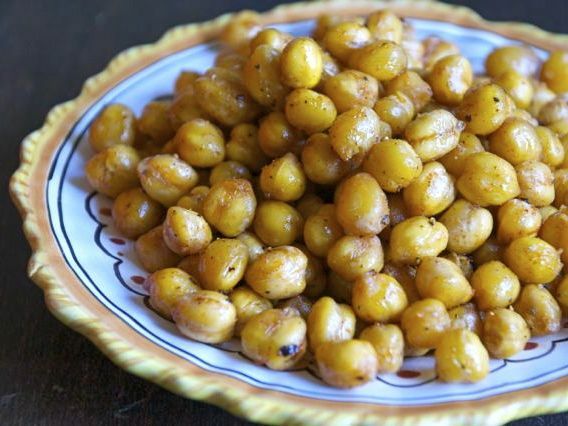 Roasting cooked chickpeas in a little oil — first briefly on the stove and later in the oven — leaves their insides tender while adding crunch to their exterior; they make both a great side dish and a perfect snack. After you take them out of the oven, try dusting with a little chile powder, curry powder, or other spice mixture, or drizzle with a little extra-virgin olive oil, some lemon juice, and a lot of black pepper. Put the oil in a large ovenproof skillet or a roasting pan large enough to hold the chickpeas in one layer, and put on the stove over medium heat. When hot, add the chickpeas and garlic and sprinkle with salt and pepper. Shake the pan so that all the chickpeas are well coated with oil and are sitting in one layer. Transfer the skillet or pan to the oven and roast, shaking the pan occasionally, until the chickpeas begin to brown, about 15 or 20 minutes. Remove from the oven and cool slightly. If desired, sprinkle with additional seasonings or salt and pepper (see headnote). Serve hot or at room temperature. Great party food: Replace 1 cup of chickpeas with 1 cup shelled pistachios.